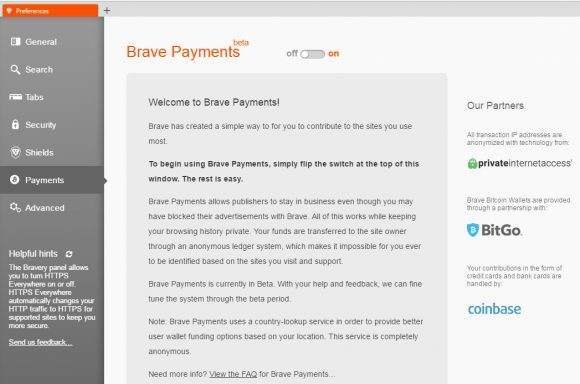 A while ago we have introduced the Brave Payments Feature Powered by Bitcoin as a means for users to support their favorite websites by using the Brave browser and tipping them with Bitcoin. Now it is time to go through the Publisher side of things, guiding you through the steps required from website owners to claim any funds their users have sent them. This is an alternative way for users to support the websites they follow and like with their ads blocked by the Brave browser, because after all ads are usually the main revenue stream for most websites that do not sell products or services, but instead provide information. 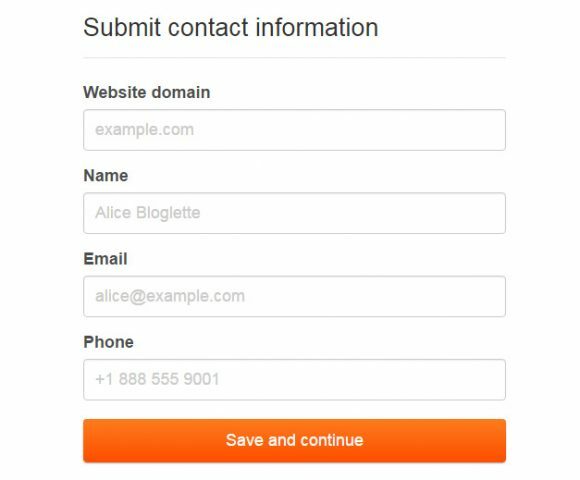 The first step is to enter your website URL and your contact details, after submitting that information you will receive an email to the address you have entered with a confirmation link. You need to click on that link in order to confirm you are the owner of the email address that you have entered in the contact information form. The next step is to confirm your actual ownership of the website you are registering in the Publisher program of Brave, there are two options here – wait a couple of days to be contacted by a Brave Publisher Partner to complete the process or add a DNS record to the domain of the website in order to automatically complete the verification process in a couple of minutes. The second option is preferred if you have access to the DNS records of your domain and can add an extra TXT record to finish the confirmation process, otherwise you will just have to wait to be contacted. Finishing the website ownership confirmation will show you if you actually have some fund pending that users may already sent your way and it also requires you to go through some more additional steps like entering your Bitcoin address where any funds you receive will be transferred on a monthly basis. After entering your Bitcoin address you will also need to Declare IRS tax status by filling in the respective electronic tax form and submitting the information to Brave depending if you are US or Non-US based individual or a company. 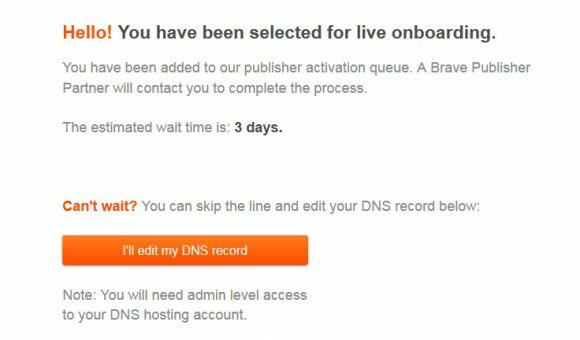 That is it you are ready to get supported with Bitcoin tips by your readers if they are using the Brave browser’s Brave Payments feature and you should now focus on better content than thinking about getting advertisers. Also if you still haven’t tied the Brave browser now is probably a great time to – download it and give it a try, the browser is available for Windows, Linux and Mac as well as Android and iOS mobile platforms. 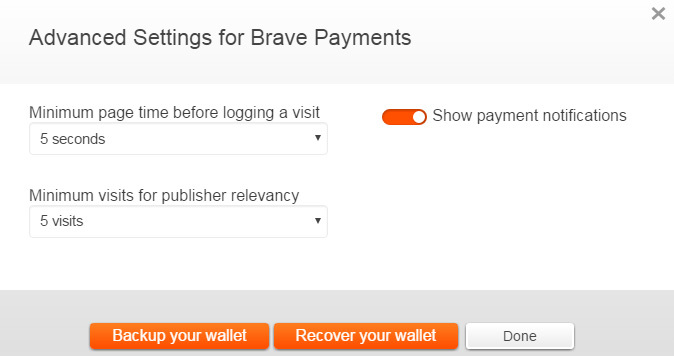 If you want to try the Brave Payments beta feature you need to open up the Brave browser’s settings and go to the Payments tab, where you will find an off-on switch that would allow you to enable the feature. The basic control panel here allows you to select a monthly budget from a dropdown menu (5 USD to 20 USD) and see what amount in USD you currently have (deposited in Bitcoin). Once you enable the feature you will get a Bitcoin wallet address generated for you where you can deposit BTC that will be used to support your favorite websites. 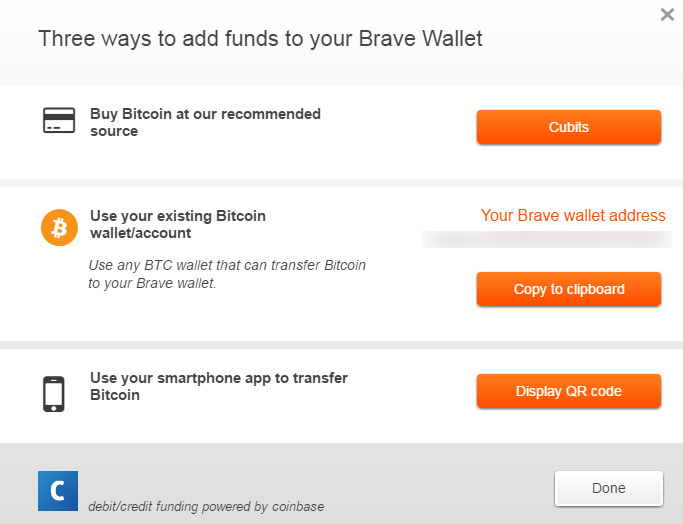 There are multiple ways to obtain Bitcoins available, but after you have a hold of some you need to send them to the BTC wallet address you get shown when you click on the Add funds button in the Brave Payments window. Bitcoin transactions do require 1 confirmation on the network before the USD balance becomes available in your account. When you start using the Brave browser you will see a list of websites ranked by the time you spent on them, in this list you can choose which sites you want to support using the Include switch (it is ON by default, though it should probably be OFF for new ones). The monthly budget you set, provided that you have available balance in your Brave BTC wallet is going to be distributed each month to all of the websites you decide to support, getting split according to a percentages based on a combination of how many pages you visit and how much time you spend on each site. 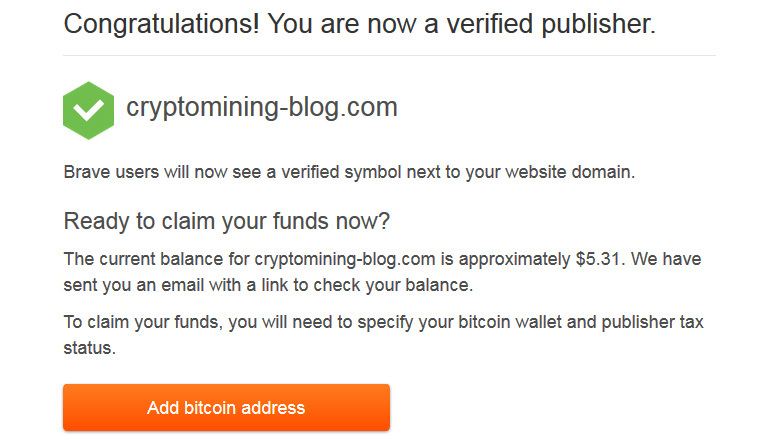 Payments from users to website publishers are being made once a month. 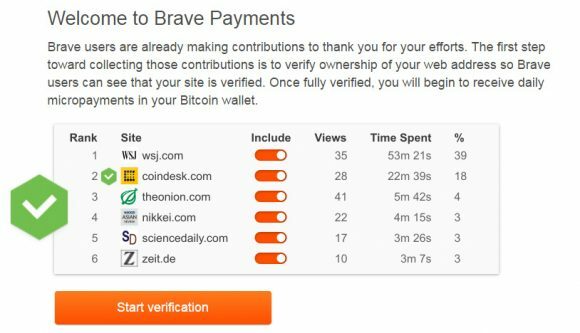 Site owners that want to be able to receive funds from users supporting them through the Brave browser will need to verify themselves. According to the information available that will happen once there are at least $10 USD in BTC available for them from users with confirmation/registration emails being sent to the domain owners and the webmaster of the website. We are yet to go through that procedure to see how it goes, but the rest we have tried does seem to work pretty well already. The Advanced Settings menu allows you to do some important things such as the minimum page time before logging a visit as well as the minimum visits fro publisher relevancy. You will most likely want to increase these values from their default lows in order to filter out random websites that you visit just once for example. The other very important functionality in this menu is the ability for backing up and recovering your Brave BTC wallet, this is something that you would want to make sure you backup just in case as you will be holding some amount of BTC in it if you will be using the Brave Payments feature. For the moment the only way to take advantage of the Brave Payments beta feature is if you deposit some coins in your Brave wallet, but in the future the Brave browser will allow you to also earn while suing the browser if you want to. 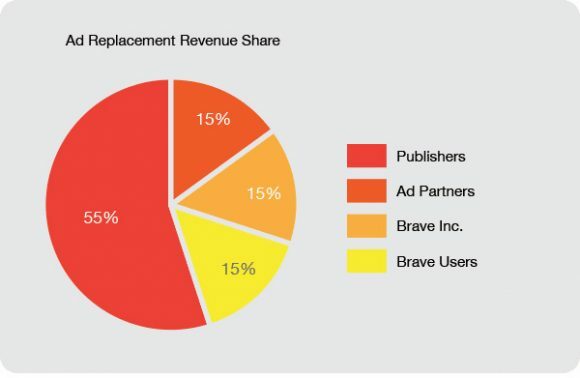 The standard functionality of the Brave browser is to block ads, but it can also replace them with Brave ads and for seeing these both website publishers and users might also have an additional stream of income. Above is the table with the percentage share for profit that will be coming from replaced ads, 55% go to the publishers and 15% go to the people that actually see the ads using the Brave browser. For the moment however there are still no replacement ads available apparently, but in the near future we may actually see that functionality becoming available in beta as well, just like the Brave Payments feature now.